Look no further for a unique personalized* gift for a “Greek” baby. 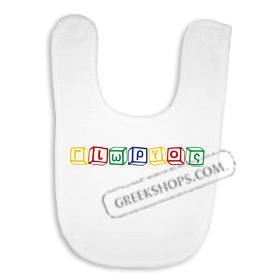 This Greekshops.com exclusive line is available on white 100% polyester microfiber bibs. The bib is approximately 12 1/4 inches long and 7 1/2 inches wide and there is a velcro closure. We are adding names constantly based on our customers’ requests. For the way names are spelled and pictures of product variations, [Click Here] to view a sample list of names.